Some automobile drivers are ignorant. Pop quiz: What does this sign mean? I'm going to go out on a limb and say that at least 25% of the people in my home town do not know what this sign means, or if they do, they're either too distracted behind the wheel, or they just don't care. Maybe that number is a little high, but it sure seems that way sometimes. I've seen people run through crosswalks before, but I never really noticed how bad an epidemic it's become since adopting our last rescue dog and going on daily walks that include twice having to use crosswalks. Conclusion: Some people are simply ignorant. 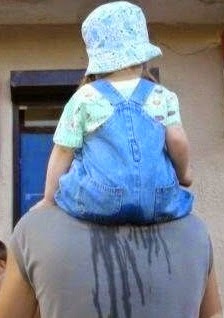 On one such walk I noticed a man walking a bicycle with an infant on the back child seat, just about get run over by two cars while he was already half way across the four-lane street. What's wrong with drivers today? 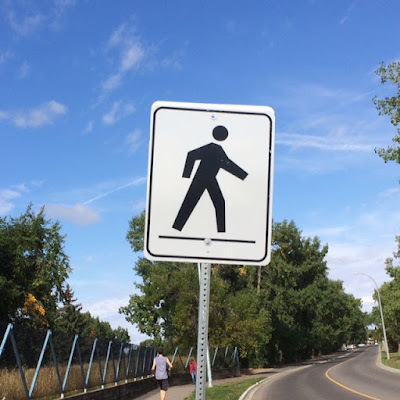 Pedestrians really do take their lives in their hands walking across designated pedestrian crosswalks. Unbelievable! 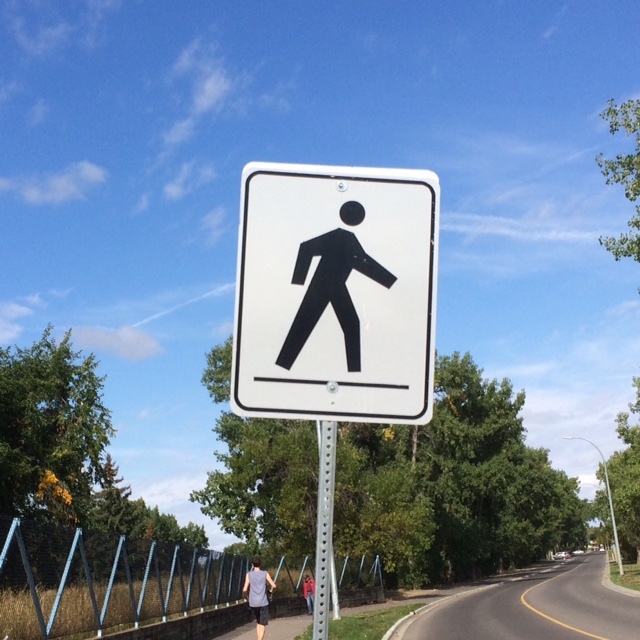 We walk on multi-use trails with two-way pedestrian and bicyclist traffic. The other day a cyclist came out of nowhere past my dog, freaking the dog out in the process. Would have served him right if the dog had taken a bite out of his leg. When I called back after him saying, "Thanks for the warning," he looked back at me dumbfounded and completely oblivious as to what had just happened. Many cyclists are good, either ringing a bell before they pass you, or calling from behind, "Passing on your left." I appreciate people like that; their courtesy makes it safe for everyone. However, it's those few who 'race' bicycles - around trails with joggers, people walking dogs, young children out for a stroll with their families - unfortunately make it dangerous for others. A little trail-sharing etiquette would be appreciated. Some dog owners are ignorant. I think most dog owners are pretty good, but I've noticed that there are also a few ignorant ones out there. How so? 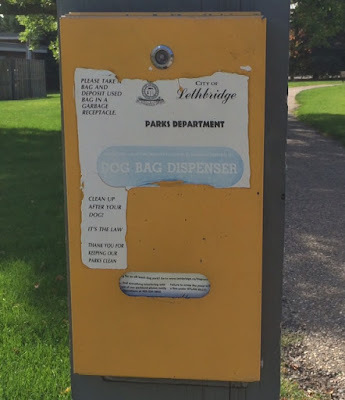 They're ignorant in that they refuse to pick up their dog's feces, despite the fact that our city even provides bags in the parks for exactly that purpose. I have half a mind to pick it up myself and throw it back at the dog owner when I see that! Really people? Let's grab a brain! Another pet peeve about some dog owners is those who seem to think that bylaws which state that "Dogs must be on leashes" don't apply to them. I have rounded corners on the trails by our neighbourhood lake/park to find dogs off leashes. It's one thing when the dog is small, although they can get pretty chewed up by my 98-pound dog if we're not careful; it's quite another to find a large breed dog off-leash facing you on the trail, as was the case a couple days ago. Its ignoramus owner nonchalantly came along, leash in hand, but not until I had to restrain my dog from the potential dog fight. When I reminded him that this was a leash-required park that included a risk of bylaw fines for offenders, he didn't seem to care less. Point is, there are park areas provided by the city for those who want to run their dogs off leashes; why don't these ignoramuses go there? I prefer the control of a leashed area to walk my dog, and I think I have that right too. Well there you have it; three types of ignoramus behaviour that I've observed while walking my dog. Did I come across too harsh? Maybe, but I make no apologies; these types of things infuriate me! I'm not suggesting that I'm perfect and beyond screwing up, but I like to think that I have a little more concern for my fellow man, especially if they're out there enjoying the same park spaces as me. That's the way I see it. Thanks for listening to my rant. Peace.